Cristiano Ronaldo disguises himself and scores for Monster with no paid media. Imagine Cristiano Ronaldo beefed up with a padded suit, scruffy hair and ratty clothes. Can’t right? Well, that’s exactly how Monster used the world’s highest paid footballer to launch new ROC Live Life Loud brand. 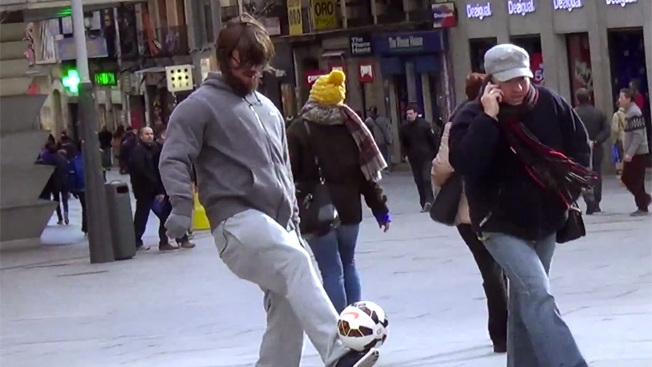 Ronaldo in an undesirable avatar doing cool footwork with the ball in downtown Madrid goes unnoticed. Ronaldo prompts onlookers to play on by showing off some fancy tricks. In the end, a kid who’s playing along with the strange-looking man, gets the biggest surprise of his life – a chance to meet Cristiano Ronaldo. The stunned kid received an autographed ball as Ronaldo revealed himself by peeling off the beard and wig. What an ingenious way to launch a brand with no paid media push. It racked up 33 million views in two days with over 900,000 shares, 1.4 million likes and 100,000 comments. In just a week, it had close to 9 million views on YouTube. It was a bold move indeed to disguise the celebrity footballer. Most clients would have refused after paying a hefty price to rope in Ronaldo. The brand definitely got the eyeballs it needed. Simply by breaking the codes of advertising.